Look who has written to us! We have been learning how fish and humans breathe and Megan brought in a puffer fish to help with our understanding. Thanks Megan, this was really exciting to look at! Children worked incredibly hard to print a table cloth using leaves and arranged flowers to celebrate the Queen's birthday. Thank you so much for the kind donations. Please visit the church to see them; they are stunning! 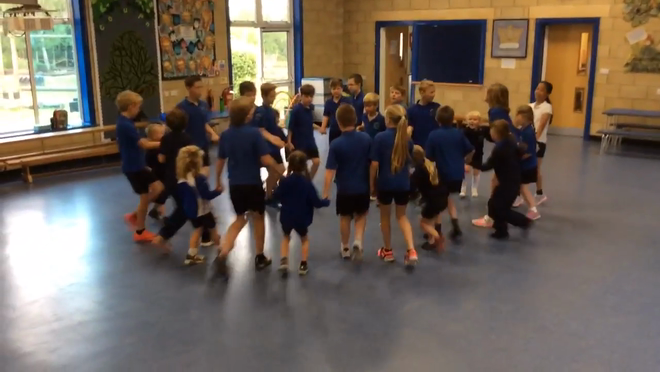 We have been country dancing with some of the older children! We made a tea tray flower display for the Queen's 90th birthday. We used clay and printed, rolled, shaped and cut our pigeons ready for our Royal Mail project. Kingston Lacy was enormous fun! We explored the grounds, used hammers to leaf print, made mud faces, planted seeds and fed the pigs. 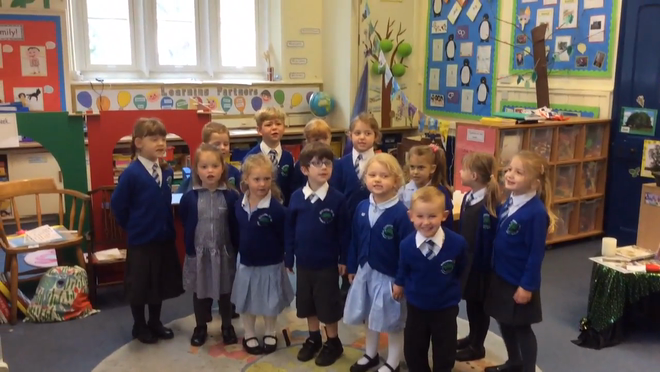 We had a picnic lunch and sang all the way there and back again! We found out about different parts of the church today during a visit where we made welcome crosses, made stained glass jars, sewed binca crosses and wrote prayers. What an exciting visit from our beekeeper. We got to observe the workers and queen, try on bee suits and taste honey. We were buzzing! We worked really hard in gymnastics this week and focused on beam and bar activities. Today the children planted potatoes and broad beans in the spiritual garden with Mr Stone and thought about how to keep plants healthy. Luckily we missed the snow and sleet walking to Port Regis and had another fun session at the gym. 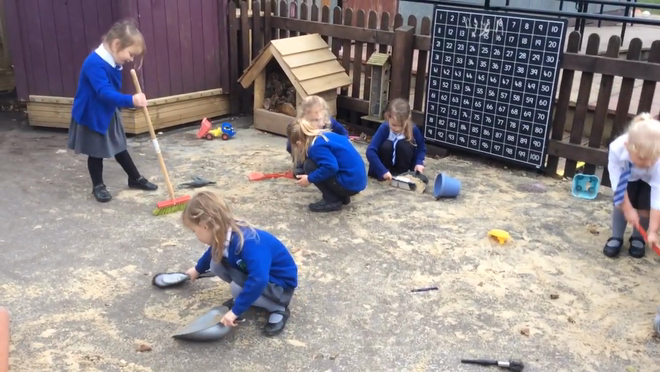 We retold 'Susie Snail' and this prompted a snail hunt. We then observed them move across sugar paper before drawing them and writing character descriptions. What does the Queen do all day? This was the question we asked.. We got some very interesting replies! Today we planted our rocket seeds that have been whizzing around planet earth for months. We can't wait to look after them and to find out about how zero gravity influences growth! 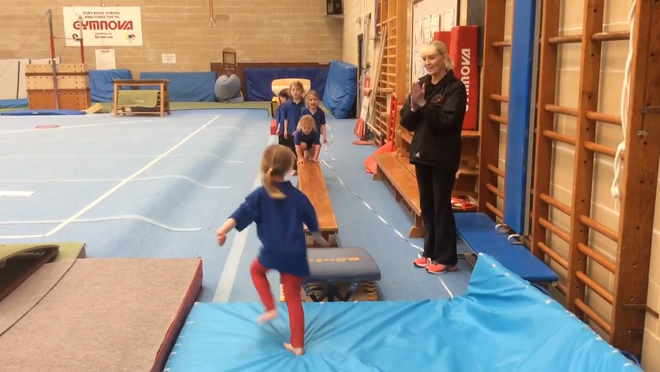 Our first session of gymnastics at Port Regis was enormous fun. 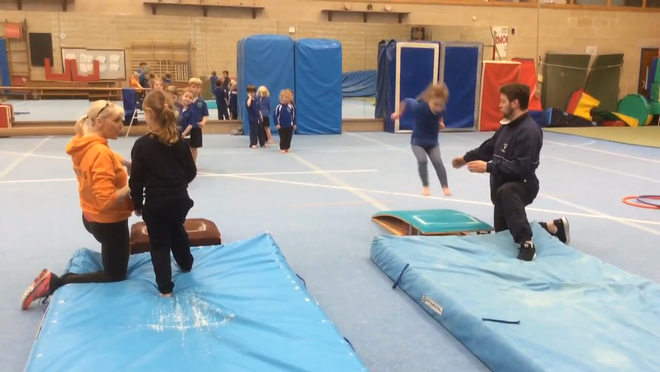 We did forward rolls, floor work and practised jumping off the spring board. Roll on next week! We used the book 'Making Friends is an Art' as a stimulus and went on a colour hunt, mixed colours to make our own colour strip and explored mixing paint with shaving foam - why do you always make brown! We made a friendship web and used this to say nice things about each other. We know that in order to have friends we need to be a good friend. 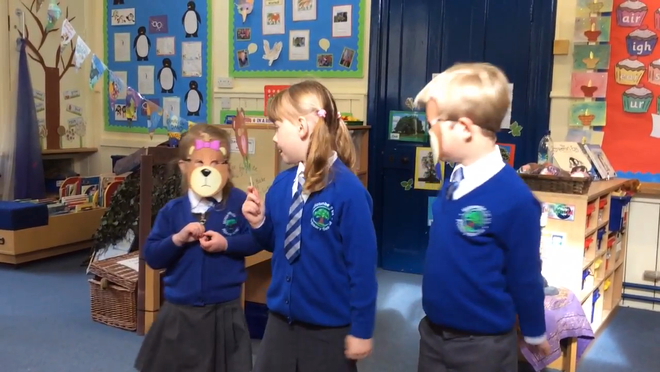 You can now practise spellings online with 'Spellodrome.' Click this link and log on using your mathletics username and password. Keep practising mathletics; who will be the next Duckling to get a certificate? Easter breakfast was enormous fun. Thank you everyone for coming and to the PTA for organising such a great event. We used the story 'Wombat goes Walkabout' as a stimulus for some incredible pastel art work today. We then thought about animals native to Britain and Australia. Not only did we dance our hearts out for Sports Relief but we had tennis tuition too. We finished this busy day by making chocolate cakes whilst learning about how chocolate is made. We have been for a welly walk to look for signs of spring. 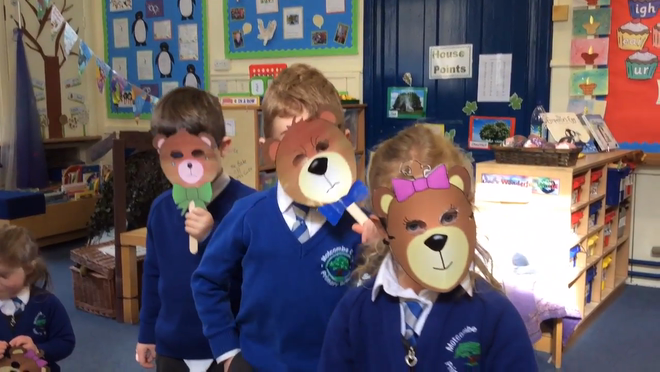 Listen to our great bear voices...can you guess who we are? 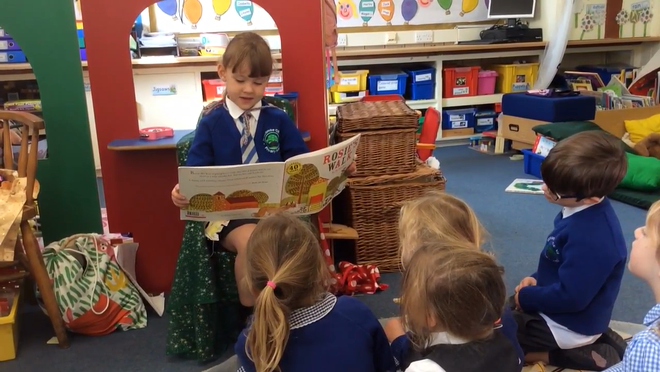 We have been retelling the story of Goldilocks and the Three Bears and have enjoyed reading books in the den. After watching Handa's Surprise we shared words to describe the feel and smell of various fruit. We followed instructions well and rolled, pinched, smoothed and sculpted clay to make daddy, mummy or baby bear. We shared our learning with mums and dads following an assembly where we told our penguin story, South Pole facts and sang. We thoroughly enjoyed our visit from Shaftesbury Library today and listened to stories, sang songs and went on a treasure hunt. Our photo made the Dorset Echo...please come and see me if you want to order a copy. In 'Lost and Found' the penguin travelled from the South Pole in an umbrella. We had twenty minutes to build a boat using whatever we wanted in a challenge afternoon and then checked to see if it would float. What do you think of our amazing 'Noah' art project? Christmas dinner was delicious! We all pulled crackers, told jokes and tucked into a yummy lunch and pudding. Thank you to everyone who helped to organise and serve today. Happy Christmas everybody! What happens when you dunk a biscuit? Do all biscuits behave in the same way? Do some biscuits take longer to break than others? How can you check? Do you have any old newspapers that we could use to protect our tables when getting messy?! We are almost out and would appreciate any that you could provide. Thank you. 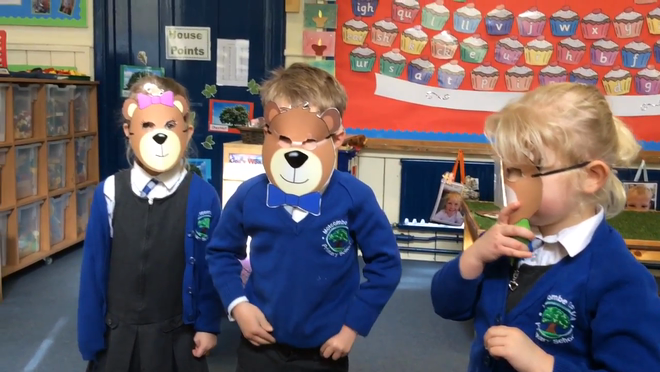 We gave our first performance today to KS2 of 'Rodney the Stable Rat.' 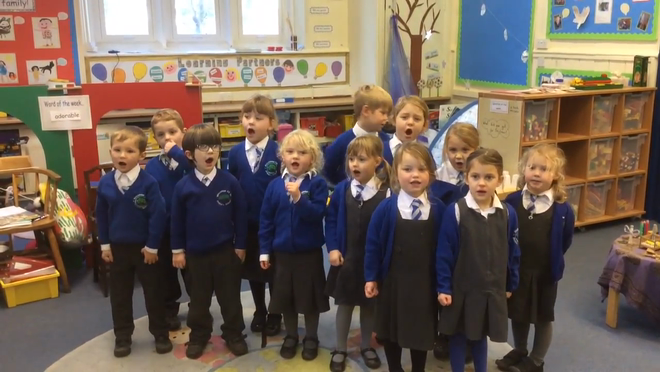 We sang our hearts out whilst wiggling and jiggling along to the music. We have been learning about the Christmas story and have made characters using clothes pegs for our Reflection Table. We added food colouring to blocks of ice and explored. As the ice melted we thought about colour mixing. Thank you to the PTA for funding our wonderful bikes and scooters. As you can see we have enjoyed racing around the playground today! We mixed, sieved, kneaded, rolled and baked our Gingerbread men before tucking in; delicious! Forest school was phenomenal! We explored, hunted for bugs, walked along secret pathways and made clay faces on trees using leaves and debris. Finally, we sat around the fire pit and drank hot chocolate whilst listening to a story. The popcorn eventually popped on the fire and we gobbled it up when we got back. 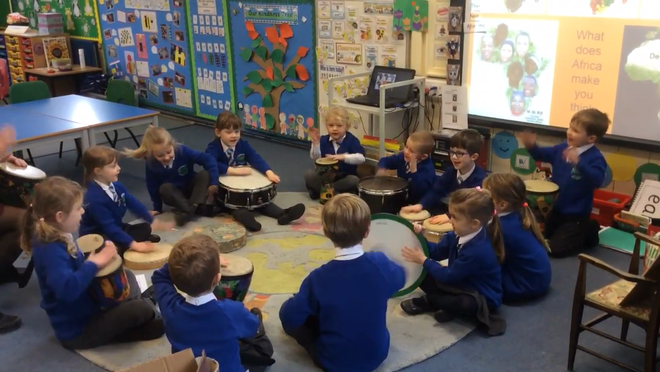 We welcomed reception children from Port Regis into Ducklings Class today and were brilliant at sharing our lovely resources and classroom. We ventured into church this morning for a treasure hunt and then delighted in listening to Mr. Heming read his favourite story. What a busy week! We have made, eaten and written about how yummy our bread tasted. Our giant Elmer made from sandwiches tasted delicious! A special thank you to Mrs Bianconi who read a wonderful story about cats. Have a lovely half term! Sculptor, Mrs Dawkins-White, helped us all to make Rosie the hen out of clay today. We listened, moulded, shaped and painted the clay. Don't they look great! We have been practising our numbers today by counting, ordering and matching number to quantity using a variety of resources. We all thoroughly enjoyed welcoming Louisa's mummy into class today to share one of her favourite books. Thank you! How amazing were we today?! We spoke, sang, said a prayer and shared our scarecrow with friends and family during our harvest festival. Visiting Sophie Countess of Wessex was a super experience. She chatted to us wanting to know what lessons we were missing! 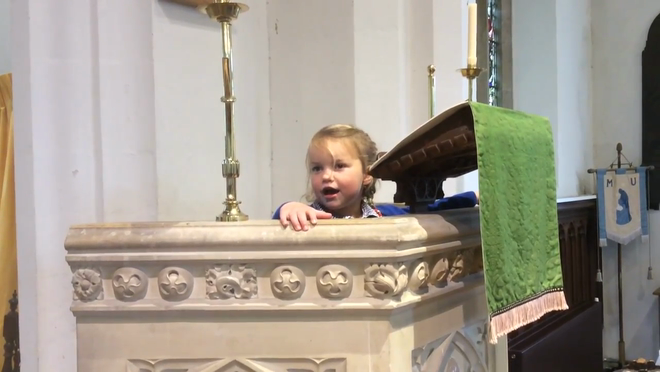 Today we went to church for our welcome service. We sang songs, lit candles and explored the church before placing our pebbles in the Spiritual Garden. We met our buddies today and were most excited to meet up again at lunchtime on the field! We have painted self portraits; aren't we a clever bunch! Can you guess who's who? Our first day was filled with fun and laughter as we explored both the indoor and outdoor classrooms together. What a super start to term!